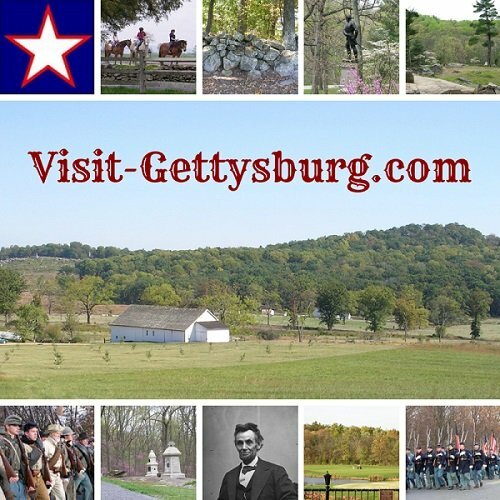 Are you planning to visit historic Gettysburg, PA? Visit Gettysburg for its many attractions, food and more. Interesting historical fact: during the Civil War soldiers who wanted to go to the bathroom had to go to open latrine areas that were raked and buried over daily. Private toilets were generally available only to senior officers, and even so still a far stretch from the best toilet we enjoy today. I love Gettysburg for its beauty. My favorite time to visit is in the spring when the native pink redbuds and white dogwood trees are in bloom. 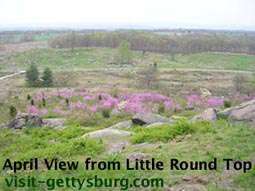 Sitting on Little Round Top, watching the sun set over the hills and hearing the shouts and laughter of children playing in Devil’s Den below… that is when I feel most grateful to the men who shed their blood there. They hallowed that spot that it might be preserved as a reminder of what our country means to us. This small town has a special meaning for me. I live a little over an hour away in Maryland. A trip there is like a vacation. It has the feel of a vacation spot with tourists around, but it never feels crowded and oppressive like Washington, D.C. can. Surrounded by battlefields, it still has 19th century small town charm. On this website, I will share what I love about the area and the best places to visit on your trip or family vacation. Some of my favorite places will take you beyond the battlefield and off the beaten path. I encourage you to explore beyond what you learned in history class in school. Visit this special area with me. It truly is a beautiful place. You can also keep in touch through Twitter, subscribe to the RSS feed in your favorite reader, or participate on the Facebook page.